VAS and Al Mazroui Engineering Ltd, based in Abu Dhabi, have become partners in the UAE, Saudi Arabia and Jordan. Al Mazroui have sales offices in Dubai and Saudi Arabia, who will also support the new partnership. Al Mazroui will offer the full range of VAS products, and services. The management of VAS are very pleased to secure a partnership with a company of Al Mazroui’s stature and standing in the UAE and Saudi Arabia. Al Mazroui, who also represent Leybold, are the perfect partner for VAS and we look forward to a long and mutual successful partnership. A fantastic success! After much preparation, VAS are delighted to report that the 2018 Seminar, Cheltenham Festival & Golf Day was a massive success. With representatives from nearly 22 individual heat treatment sites, ranging from commercial heat treaters, to niche automotive specialists. VAS, EKAS & Eurotherm were given a wide range of industry experts to present their in-depth portfolios to. The Directors of Vacuum & Atmosphere Services proudly receive their FRS Employing Ex Forces personnel certificate from FRS Managing Director Paul Lewis. VAS have now employed three Ex-Forces Engineers, with a further Engineer to follow shortly. In the picture are new recruits, Dominic Gale, Richard Day & Paul Nelson. Nick Houghton & Paul Buttery proudly welcome three of our new ex-forces Engineers to our Service team. Following an in-depth interview process, supported by Paul Lewis of FRS, Dominic Gale, Richard Day & Paul Nelson accepted Service Engineers roles at VAS. Dominic, Richard & Paul all have outstanding attributes & qualifications & will seamlessly fit into our outstanding service team. Vacuum & Atmosphere Services Service Engineers, Support Engineers & Sales team were present at the Vacuum Furnace Principles & Operation Training Day. The course led by Mike Long, who utilised his 30 years’ experience to prepare & present the full days training session. Lee Hollis, VAS Senior Service Engineer, who also attended the course, led the practical training in our workshop in the afternoon. An amazing year on many fronts has been the story of 2017 for VAS. First and foremost we've worked with many fantastic companies and continue to do so. These range from small heat treatment shops to massive blue chip companies. We would like to thank you all for the opportunities you've given us this year - we hope we have met all your expectations and given you the level of support you expect. With projects, & orders surpassing summer 2018. The growth of VAS, has risen dramatically over the past 18 months. Over the past two months, VAS, have been ensuring the growth continues, & have been extremely proactive within the heat treatment industry. For a second time, VAS, Sponsored, Exhibited & Mike Long, VAS Managing Director, gave the headline talk on Ipsen's revolutionary, PdMetrics. VAS, invites you to join us at the Belfry Hotel & Resort. Wednesday 14th, & Thursday 15th March 2018, VAS will be hosting a morning of seminars, filled with informative talks regarding VAS’s services, products & capabilities. This will be followed by lunch, & live streaming of the Cheltenham Festival Races. There will be a scheduled dinner, & drinks throughout the night, for guests stopping within the hotel. Thursday morning will include breakfast, & a full round of golf on the PGA National Golf Course for everyone who wishes to play. VAS would like to announce that Gary Nicholls, & Pat Whitehouse have joined the VAS team. With multiple years experience within the heat treatment industry, VAS are delighted to have Gary & Pat as an addition to the already vastly experienced engineering team at VAS. Both, Gary & Pat have firmly found their feet at VAS, & are helping combat the ever growing project order book both onsite, & within the VAS factory. VAS management are pleased to announce the arrival of James Cole & Jason Cole. James will join our Sales Manager, responsible for new plant, projects and service. Jason will join our Service / Project team as Senior Service Engineer. James & Jason will help support the ever increasing demand for our services and products. Their industry knowledge & experience will help VAS to capitalise on the vast amounts of new enquiries & challenges ahead. VAS Are Looking For A New Atmosphere Sales Manager! VAS are looking to recruit an experienced Atmosphere Furnace Sales Manager! We are looking for a new Atmosphere Sales Manager, with market & furnace experience to join our ever growing team at VAS. More details regarding the full job description will be discussed dependent on the candidates previous experience & knowledge of the market. Over 2016, VAS invested heavily in employee training, too ensure our engineers were not only the most experienced, but also the most skillful. This has carried over into 2017, & we are delighted to announce that two of our engineers have successfully completed both the Ipsen Advanced Commissioning Training, & Advanced Reline Training, at Ipsen Gmbh, in Kleve. A New Addition To The VAS Team! After an extensive search, VAS management are delighted to announce Luke Simms has joined the VAS engineering team! We are looking for a new sales manager with market & furnace experience to join our ever growing team here at VAS. More details regarding the full job description will be discussed dependant on the candidates previous experience & knowledge of the market. Contrary to recent industry rumours, the Management team at VAS would like to state firmly that we have not been sold or having sales discussions with any UK competitor or equity company. VAS are on a strong growth trend and have employed three more people to cope with current demands. It is expected additional Service Engineers will be added to our team early in 2017. VAS Director Nick Houghton, joined a team of five VAS Service Engineers & one Sales Engineer on the Ipsen HeatTec Vacuum Technology, Processes & Safety training course in Kleve, Germany. The course was led by Matthias Rink, Head of Ipsen Research and Development. The training course covered of all areas of vacuum heat treatment. We are looking to recruit experienced Vacuum Furnace Engineers. Quality, knowledge & experience are just some variables that make VAS the number one provider of services & products to the heat treatment industry. This has further been strengthened with 5 VAS engineers completing an Electrical Maintenance, & Safe Electrical Isolation training course. VAS are pleased to announce that Daniel Perry will start his apprenticeship with us in September. Daniel will complete a 4 year apprenticeship, which includes day release at a local college. Daniel will be given training on both vacuum and atmosphere furnaces. VAS will install the first batch atmosphere furnace line in the UK since 2006. The new Ipsen T furnace, is totally water free and with the new HYBRIDCARB generator built in to reduce footprint. The new HYBRIDCARB replaces the old gas generators, resulting in operational savings of up to 98%. The furnaces will be equipped with the latest version of Carbo-prof. The management team at VAS are pleased to announce, after successfully completing his training period Dave Longford will become our 12th Service Engineer. After an extremely fast start to the year, VAS has seen demand rise even higher, and successfully secured and completed three relines during the 1st quarter. VAS have gone on to secure a further four more relines during the 2nd quarter. These new hot-zones include Ipsen, Schmetz, TAV, Seco Warwick and Abar. Ipsen, through UK and Ireland agents VAS, are pleased to announce that a major medical supplier have purchased 2 new Ipsen T2T XL Vacuum Furnaces and associated equipment. VAS will install and commission the new equipment during December 2016. 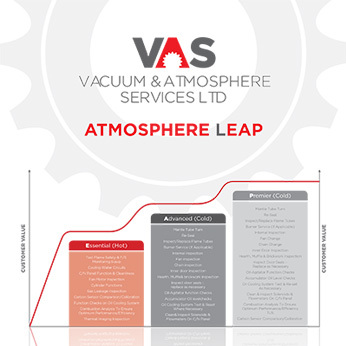 Following the launch of our new and unique LEAP servicing program, VAS have secured in excess of 35 service, TUS and calibration contracts, covering over 150 furnaces. VAS offer TUS and calibration services with NADCAP compliant instrumentation and paper work. LEAP servicing is a heat treatment service first and has been widely received by the heat treatment market, including sub contract, aerospace, medical, motor sport, automotive and oil & gas Industries. Heat treatment re-locations are something of a speciality of VAS, with this month seeing re-location of equipment from the UK & Ireland to Singapore & Romania, as well as around the UK. Our engineers are regularly working overseas, with trips this year to China, Sri Lanka, The Middle East & the US. In September this year, we are installing a full furnace line in Vietnam. It is during these relocations that the “Gas Safe” regulations come to the fore. As soon as the equipment is moved, there is an obligation to ensure that when the unit’s are re-commissioned, they are compliant with current regulations. VAS has successfully installed a new Ipsen T2T vacuum furnace at a major sub contract heat treater in the UK. The installation, commissioning and training was undertaken by VAS Engineers. The new T2T is a modular designed furnace, reducing build up, installation and commissioning times to less than 1 week in total. The new energy saving initiatives on the T2T has been proven to reduce cycle costs. VAS, invites you to join us at the Belfry Hotel & Resort. Wednesday 14th, & Thursday 15th March 2018, VAS will be hosting a morning of seminars, filled with informative talks regarding VAS’s services, products & capabilities. 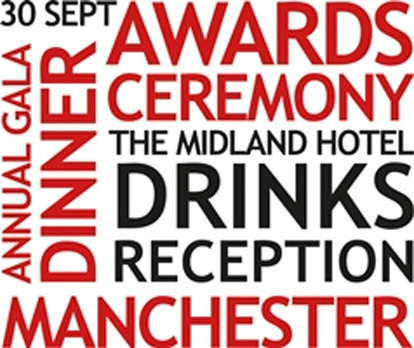 The Directors of VAS will all be present on the evening and are pleased to be involved on this prestigious occasion.